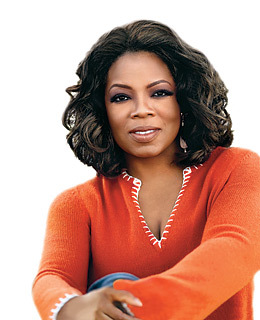 I’m kicking off my Women’s History Month ~ Ladies Making History features with the one and only, Ms. Oprah Winfrey. I admit that in her earlier years I watched the show, but did not completely embrace her until she made the life-changing shift to more social and spiritual consciousness topics and programming. With the recent launching of her network, OWN, I became a true follower of her journey and have gained so much from her own epiphanies, spiritual guests and gurus. I was unable to interview “Ms. O.” for this post, but I’m sure we can count those like Deepak Chopra, Bishop T. D. Jakes, Dr. Maya Angelou and Gail King as her inspirations. Her legacy? I would dare to say that in her capacity as one of the most wealthy women in history, she has become a vibrant life enthusiast, with a passion for helping, informing, encouraging, and making a difference in the lives of individuals globally. Cheers to you, Lady O! This entry was posted in Legacy Lessons from the C-Suite, The CEO Pundit™ and tagged Business, Candace Reese, CEO, Change, Chief executive officer, Deepak Chopra, Empowerment, Empowerment Speaker, Encouragement, Entrepreneur, Envision Global, Executive Coach, Global Branding, Higher consciousness, History, Inspiration, Inspirational Coaching, Ladies Making History, Law of Attraction, Leadership, Management, Maya Angelou, Motivation, Networking and Peer Support, Oprah Winfrey, Peace, People, Personal Development, Philanthropy, Professional Speaking, Purpose, Self-Improvement, T. D. Jakes, Teamwork, The CEO Pundit™, United States, Women, Women's History Month. Bookmark the permalink.